Kids will enjoy reigning in this colorful castle, which comes with rounded walls and towering spires for added dimension.The spacious interior jumping area offers a basketball hoop, an exciting climb feature and a convenient exit slide for hours of active fun! Parents and spectators are offered easy viewing with the 360-degree mesh sides. The Fantasy Castle Combo is made of lite n strong fire-resistant vinyl making a safe, durable and perfectly portable product. This awesome Fantasy Castle Combo is sure to make any indoor or outdoor event a great success! 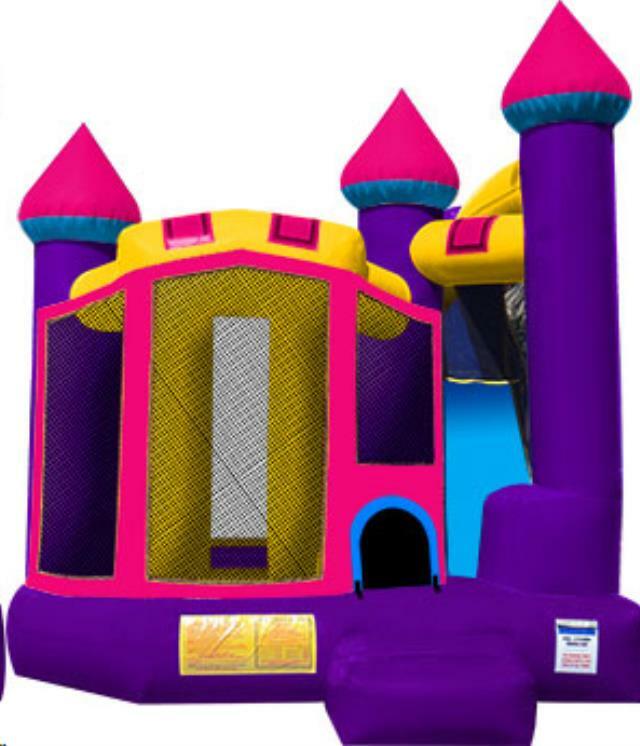 * Please call us for any questions on our fantasy castle slide bounce combo rentals in Rocky Mount and Wilson NC.